This car was successfully converted from Need For Speed : World Online. THIS CAR REPLACES MITSUBISHI ECLIPSE GT. -Arushan for discovering the NFSMW:Modtools & the respective authors for the tools required. -raven54 for ripping the mesh & textures. -Corvettez06 for sending me the mesh & textures. 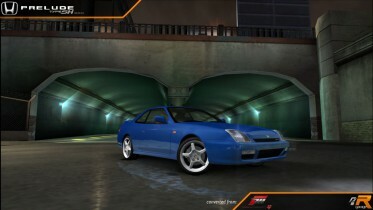 -Racer_S for NFS:MW Camera Hack. -FDen95 for Modern Rockport Textures. 1:>Copy modloader & d3d9.dll to your NFS:MW directory. 2:>Make a new folder ADDONS in your NFS:MW directory. 3:>In the ADDONS folder again make a new folder named CARS_REPLACE. 4:>Copy the folder ECLIPSEGT inside the CARS_REPLACE folder. 5:>Create a shortcut of Speed.exe which is inside the directory where you have installed NFS:MW. Right click on the shortcut & click on Properties. Then in the target box add '-mod' at the end without commas & leave a space between it & speed.exe. Then click on Apply & OK.
6:>Then run the game & select Eclipse GT. Eclipse GS-T Elite will be visible instead of it. NOTE : If you have installed ENB series, no need to follow Step No.1 mentioned above. -Change bodykits - 5 kits excluding stock. Kits 2 & 3 are paintable. Kit 2 has transparent hood whereas Kit 3 has opaque hood. Kits 4-6 are same as Kits 1-3 except they have NFS:MW nameplate. -Change rims - all styles & sizes. REST NOT MENTIONED IS NON-CUSTOMIZABLE. -You have problem installing the model. -You want to modify, tune or convert this vehicle to other games. -You have complaint regarding this vehicle. -You seen some bugs in this vehicle. -You want to request me to convert a certain vehicle. -You want this vehicle to be replaced on another vehicle. I WONT HELP YOU & YOUR MAIL WILL BE IGNORED & DELETED. 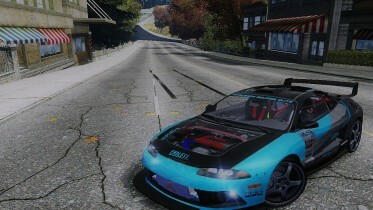 I have invested a lot of time in converting many cars to NFS:Most Wanted. I improve with every conversion & it takes lot of time & effort to convert cars to Most Wanted. It is a tough job to fix wheel & light positions & also making performance. So please respect my work. Please dont steal & make duplicate copies of this vehicle. 1:>You are not allowed to use any part of this vehicle without my permission. 2:>You are not allowed to tune, modify or convert this vehicle to other games without my permission. 3:>You are free to upload this vehicle to any website provided that the files, author & description remains the same. -This car is not fully customizable. Its not a bug. I have just kept it that way. -This car has no reverse lights. PLEASE DO NOT PUT CAR REQUESTS & OTHER GAY STUFF IN THE COMMENTS. THEY WILL BE IGNORED. IN THE SCREENSHOTS, I HAVE JUST SHOWN THE EXTENT TO WHICH THE CAR CAN BE CUSTOMIZED. I AM NOT A RICER. FEEL FREE TO UPLOAD THIS MOD TO ANY WEBSITE YOU WANT WITHOUT CHANGING THE FILES & AUTHOR. THE GRAPHICS ARE NOT A PART OF THE PACKAGE. PLEASE DONT REUPLOAD TO THESE SITES.